QURAN TRANSLATION CHENNAI: WHAT IS QURAN ? The Qur'an is the most often-read book in the world. Revealed by God to the Prophet Muhammad (peace be upon him) in the 7th century, and revered by Muslims as being God's final Scripture and Testament, its words have been lovingly recited, memorized, and implemented by Muslims of every nationality ever since. The faithful are inspired, consoled often moved to tears by its eloquence and poetic imagery, especially when recited aloud. And yet, the Qur'an is unique in being the only Scripture that is free of scientific inaccuracies, whose historical authenticity can be verified, and whose text has been so carefully preserved that just one authorized version (in Arabic) exists. Approximately the length of the New Testament, the Qur'an is also the only holy book that can be memorized in its entirety by people of all ages and intellectual abilities - including non-Arabic speakers - which Muslims consider to be one of its miracles. Wahy (Arabic: وحي‎ waḥy) is the Arabic word for revelation. In Islamic context, it refers to the revelations and inspirations of God (Arabic: Allah) to his prophets, for all humankind. In Islam, the Qur'an is considered a Wahy given to Muhammad. It is a higher form of revelation than Ilhaam & Wahi. Wahy, unlike the lesser forms of revelation, is considered flawless. The word awha (أوحى awḥá) occurs in a number of shades of meaning in the Qur'an, each of them indicating the main underlying idea of inspiration directing or guiding someone. The word 'wahy' (revelation) is derived from awha. According to Rudi Paret, "The accusation of dishonesty which has been laid down against the Prophet time and again over the centuries up to the most recent times with varying degrees of vehemence is relatively easy to refute." Annemarie Schimmel states that most recent studies of Muhammad indicate that Muhammad devoutly believed that he was God's instrument. William Montgomery Watt argues that only Muhammad's sincerity can explain his "readiness to endure hardship and persecution during the Meccan period when from a secular point of view there was no prospect of success. To carry on in the face of persecution and hostility would have been impossible for him unless he was fully persuaded that God had sent him. " Sometimes he [Muhammad] may have heard the words being spoken to him, but for most part he seems simply to have "found them in his heart". Whatever the precise "manner of revelation"-and several different 'manners' were listed by Muslim scholars- the important point is that the message was not the product of Muhammad's conscious mind. He believed he could easily distinguish between his own thinking and these revelations. His sincerity in this belief must be accepted by the modern historian, for this alone makes credible the development of a great religion. The further question, however, whether the messages came from Muhammad's unconscious, or the collective unconscious functioning in him, or from some divine source, is beyond the competence of the historian. The really powerful factor in Muḥammad's life and the essential clue to his extraordinary success was his unshakable belief from beginning to end that he had been called by God. A conviction such as this, which, once firmly established, does not admit of the slightest doubt, exercises an incalculable influence on others. The certainty with which he came forward as the executor of God's will gave his words and ordinances an authority that proved finally compelling. Watt notes that "To say that Muhammad was sincere does not imply that he was correct in his beliefs. A man maybe sincere but mistaken. The modern Westerner has not difficulty in showing how Muhammad may have been mistaken. What seems to a man to come from 'outside himself' may actually come from his unconscious." 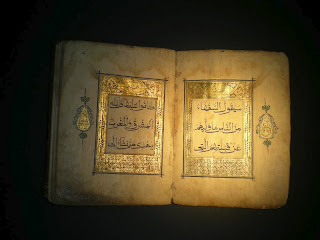 The Qur’an (Arabic: القرآن‎ al-qur’ān, literally “the recitation”; also sometimes transliterated as Quran, Qur’ān, Koran, Alcoran or Al-Qur’ān) is the central religious text of Islam. Muslims believe the Qur’an to be the book of divine guidance and direction for mankind, and consider the original Arabic text to be the final revelation of God. Muslims regard the Qur’an as the culmination of a series of divine messages that started with those revealed to Adam, regarded in Islam as the first prophet, and continued with the Suhuf Ibrahim (Sefer Yetzirah or Scrolls of Abraham), the Tawrat (Torah or Pentateuch), the Zabur (Tehillim or Book of Psalms), and the Injeel (Christian Gospel). The contents of the aforementioned books are not physically affixed within the Qur’an, but are recognized therein. The Qur’an also refers to many events from Jewish and Christian scriptures, some of which are retold in comparatively distinctive ways from the Torah and New Testament respectively, while obliquely referring to other events described explicitly in those texts. The Qur'an itself expresses that it is the book of guidance. Therefore it rarely offers detailed accounts of historical events; the text instead typically placing emphasis on the moral significance of an event rather than its narrative sequence. Muslims believe the Qur'an itself to be the main miracle of Muhammad and a proof of his prophethood. The text of the Qur’an consists of 114 chapters of varying lengths, each known as a sura. Chapters are classed as Meccan or Medinan, depending on where the verses were revealed. Chapter titles are derived from a name or quality discussed in the text, or from the first letters or words of the sura. Muslims believe that Muhammad, on God's command, gave the chapters their names. Generally, longer chapters appear earlier in the Qur’an, while the shorter ones appear later. The chapter arrangement is thus not connected to the sequence of revelation. Each sura except the ninth commences with the Basmala, an Arabic phrase meaning (“In the name of God, Most Gracious, Most Merciful”). There are, however, still 114 occurrences of the basmala in the Qur’an, due to its presence in verse 27:30 as the opening of Solomon's letter to the Queen of Sheba. There is a crosscutting division into 30 parts, ajza, each containing two units called ahzab, each of which is divided into four parts (rub 'al-ahzab). The Qur’an is also divided into seven stations (manazil). The Qur’an's message is conveyed through the use of various literary structures and devices. In the original Arabic, the chapters and verses employ phonetic and thematic structures that assist the audience's efforts to recall the message of the text. There is consensus among Arab scholars to use the Qur’an as a standard by which other Arabic literature should be measured. Muslims assert (in accordance with the Qur’an itself) that the Qur’anic content and style is inimitable. "The values presented in the very early Meccan revelations are repeated throughout the hymnic Suras. There is a sense of directness, of intimacy, as if the hearer were being asked repeatedly a simple question: what will be of value at the end of a human life?" The Qur'an frequently asserts in its text that it is divinely ordained, an assertion that Muslims believe. The Qur'an — often referring to its own textual nature and reflecting constantly on its divine origin — is the most meta-textual, self-referential religious text. The Qur'an refers to a written pre-text which records God's speech even before it was sent down. Therefore an Islamic philosopher introduces a prophetology to explain how the divine word passes into human expression. This leads to a kind of esoteric hermeneutics which seeks to comprehend the position of the prophet by mediating on the modality of his relationship not with his own time, but with the eternal source from which his message emanates. This view contrasts with historical critique of western scholars who attempt to understand the prophet through his circumstances, education and type of genius. Islamic scholars believe the Qur’an to be miraculous by its very nature in being a revealed text and that similar texts cannot be written by human endeavor. Its miraculous nature is claimed to be evidenced by its literary style, suggested similarities between Qur’anic verses and scientific facts discovered much later, and various prophecies. The Qur’an itself challenges those who deny its claimed divine origin to produce a text like it. [Qur'an 17:88][Qur'an 2:23][Qur'an 10:38]. These claims originate directly from Islamic belief in its revealed nature, and are widely disputed by non-Muslim scholars of Islamic history. Welch, a scholar of Islamic studies, states in the Encyclopaedia of Islam that he believes the graphic descriptions of Muhammad's condition at these moments may be regarded as genuine, seeing as he was severely disturbed after these revelations. According to Welch, these seizures would have been seen by those around him as convincing evidence for the superhuman origin of Muhammad's inspirations. Muhammad's critics, however, accused him of being a possessed man, a soothsayer or a magician since his experiences were similar to those claimed by such figures well-known in ancient Arabia. Additionally, Welch states that it remains uncertain whether these experiences occurred before or after Muhammad began to see himself as a prophet. The Qur’an states that Muhammad was ummi, interpreted as illiterate in Muslim tradition. According to Watt, the meaning of the Qur’anic term ummi is unscriptured rather than illiterate. Watt argues that a certain amount of writing was necessary for Muhammad to perform his commercial duties though it seems certain that he had not read any scriptures. According to Shia and some Sunni scholars, Ali compiled a complete version of the Qur’an mus'haf  immediately after Muhammad's death. The order of this mus'haf differed from that gathered later during Uthman's era. Despite this, Ali made no objection or resistance against standardized mus'haf, but kept his own book. In about 650, as Islam expanded beyond the Arabian peninsula into Persia, the Levant and North Africa, the third caliph Uthman ibn Affan ordered the preparation of an official, standardized version, in order to preserve the sanctity of the text (and perhaps to keep the Rashidun Empire united, see Uthman Qur'an). Five reciters from amongst the companions produced a unique text from the first volume which had been prepared on the orders of Abu Bakr and which was kept with Hafsa bint Umar. The other copies already in the hands of Muslims in other areas were collected and sent to Medina where, on orders of the Caliph, they were destroyed by burning or boiling. This remains the authoritative text of the Qur’an to this day. To perform salat (prayer), a mandatory obligation in Islam, a Muslim is required to learn at least some suar of the Qur’an (typically starting with the first one, al-Fatiha, known as the "seven oft-repeated verses," and then moving on to the shorter ones at the end). Until one has learned al-Fatiha, a Muslim can only say phrases like "praise be to God" during the salat. These recitations differ in the vocalization (tashkil) of a few words, which in turn gives a complementary meaning to the word in question according to the rules of Arabic grammar. For example, the vocalization of a verb can change its active and passive voice. It can also change its stem formation, implying intensity for example. Vowels may be elongated or shortened, and glottal stops (hamzas) may be added or dropped, according to the respective rules of the particular recitation. For example, the name of archangel Gabriel is pronounced differently in different recitations: Jibrīl, Jabrīl, Jibra'īl, and Jibra'il. The name "Qur’an" is pronounced without the glottal stop in one recitation, and Abraham's name is pronounced Ibrāhām in another. The more widely used narrations are those of Hafss (حفص عن عاصم), Warsh (ورش عن نافع), Qaloon (قالون عن نافع) and Al-Duri according to Abu `Amr (الدوري عن أبي عمرو). Muslims firmly believe that all canonical recitations were recited by Muhammad himself, citing the respective isnad chain of narration, and accept them as valid for worshipping and as a reference for rules of Sharia. The uncanonical recitations are called "explanatory" for their role in giving a different perspective for a given verse or ayah. Today several dozen persons hold the title "Memorizer of the Ten Recitations." This is considered a great accomplishment amongst Muslims. Abu Abd al-Rahman al-Sulami reports, "the reading of Abu Bakr, Umar, Uthman and Zayd ibn Thabit and that of all the Muhajirun and the Ansar was the same. They would read the Qur’an according to the Qira'at al-'ammah. This is the same reading which was read out twice by the Prophet (sws) to Gabriel in the year of his death. Zayd ibn Thabit was also present in this reading [called] the 'Ardah-i akhirah. It was this very reading that he taught the Qur’an to people till his death". However, the identification of the recitation of Hafss as the Qira'at al-'ammah is somewhat problematic when that was the recitation of the people of Kufa in Iraq, and there is better reason to identify the recitation of the reciters of Madinah as the dominant recitation. The reciter of Madinah was Nafi' and Imam Malik remarked "The recitation of Nafi' is Sunnah." Moreover, the dialect of Arabic spoken by Quraysh and the Arabs of the Hijaz was known to have less use of the letter hamzah, as is the case in the recitation of Nafi', whereas in the Hafs recitation the hamzah is one of the very dominant features. So the hamzah is of the dialect of the Najd whose people came to comprise the dominant Arabic element in Kufa giving some features of their dialect to their recitation, whereas the recitation of Nafi' and the people of Madinah maintained some features of the dialect of Hijaz and the Quraysh. However, the discussion of the priority of one or the other recitation is unnecessary since it is a consensus of knowledgeable people that all of the seven recitations of the Qur’an are acceptable and valid for recitation in the prayer. Moreover, the un-canonical recitations that are narrated from some of the Companions and which do not conform to the Uthmani copy of the Qur’an are not legitimate for recitation in the prayer, but knowledge of them can legitimately be used in the tafsir of the Qur’an (not as a proof but as a valid argument for an explanation of an ayah). The oldest surviving Qur’an for which movable type was used was printed in Venice in 1537/1538. It seems to have been prepared for sale in the Ottoman empire. Catherine the Great of Russia sponsored a printing of the Qur’an in 1787. This was followed by editions from Kazan (1828), Persia (1833) and Istanbul (1877). Before printing was widely adopted, the Qur’an was transmitted by copyists and calligraphers. [verification needed] Since Muslim tradition felt that directly portraying sacred figures and events might lead to idolatry, it was considered wrong to decorate the Qur’an with pictures (as was often done for Christian texts, for example). Muslims instead lavished love and care upon the sacred text itself. Arabic is written in many scripts, some of which are both complex and beautiful. Arabic calligraphy is a highly honored art, much like Chinese calligraphy. Muslims also decorated their Qur’ans with abstract figures (arabesques), colored inks, and gold leaf. Pages from some of these antique Qur’ans are displayed throughout this article. Translation of the Qur’an has always been a problematic and difficult issue. Since Islam regards the Qur’an as miraculous and inimitable (i'jaz al-Qur’an), Furthermore, an Arabic word may have a range of meanings depending on the context, making an accurate translation even more difficult. many argue that the Qur’anic text can not be reproduced in another language or form. Nevertheless, the Qur’an has been translated into most African, Asian and European languages. The first translator of the Qur’an was Salman the Persian, who translated Fatihah into Persian during the 7th century. The first complete translation of Quran was into Persian during the reign of Samanids in the 9th century. Islamic tradition holds that translations were made for Emperor Negus of Abyssinia and Byzantine Emperor Heraclius, as both received letters by Muhammad containing verses from the Qur’an. In early centuries, the permissibility of translations was not an issue, but whether one could use translations in prayer. Robert of Ketton was the first person to translate the Qur’an into a Western language, Latin, in 1143. Alexander Ross offered the first English version in 1649. In 1734, George Sale produced the first scholarly translation of the Qur’an into English; another was produced by Richard Bell in 1937, and yet another by Arthur John Arberry in 1955. All these translators were non-Muslims. There have been numerous translations by Muslims; the most popular of these are by Dr. Muhammad Muhsin Khan and Dr. Muhammad Taqi-ud-Din al Hilali, Maulana Muhammad Ali, Abdullah Yusuf Ali, M. H. Shakir, Muhammad Asad, Ghulam Ahmed Pervez, A. Momin and Marmaduke Pickthall. The English translators have sometimes favored archaic English words and constructions over their more modern or conventional equivalents; for example, two widely-read translators, A. Yusuf Ali and M. Marmaduke Pickthall, use the plural and singular "ye" and "thou" instead of the more common "you." Another common stylistic decision has been to refrain from translating "Allah" — in Arabic, literally, "The God" — into the common English word "God." These choices may differ in more recent translations. Kanzul Iman is the name of the 1910 Urdu translation of the Qur'an by Ahmad Raza Khan, the scholar who revived Sunni Islam in the Subcontinent. The Sunnis of the Subcontinent are sometimes referred to as Barelwi due to him. It was subsequently translated into English by Professor Shah Faridul Haque. Recently, it has been translated into many other regional languages and become popular on the internet. Kanzul Iman is regarded highly by Sunni Muslims. "The Qur'an possesses an external appearance and a hidden depth, an exoteric meaning and an esoteric meaning. This esoteric meaning in turn conceals an esoteric meaning (this depth possesses a depth, after the image of the celestial Spheres which are enclosed within each other). So it goes on for seven esoteric meanings (seven depths of hidden depth)." According to this view, it has also become evident that the inner meaning of the Qur’an does not eradicate or invalidate its outward meaning. Rather, it is like the soul, which gives life to the body. On this viewpoint, Corbin considers the Qur’an to play a part in Islamic philosophy, because gnosiology itself goes hand in hand with prophetology. However, it is clear that those who don't believe in the divine origin of the Qur’an or any kind of sacred or spiritual existence completely oppose any inward Qur'anic aspect. Commentaries dealing with the zahir (outward aspects) of the text are called tafsir, and hermeneutic and esoteric commentaries dealing with the batin are called ta'wil (“interpretation” or “explanation”), which involves taking the text back to its beginning. Esoteric commentators believe that the ultimate meaning of the Qur’an is known only to God. In contrast, Qur'anic literalism, followed by Salafis and Zahiris, is the belief that the Qur'an should be taken at its apparent meaning, rather than employing any sort of interpretation. This includes, for example, the belief that Allah has appendages such as hands as stated in the Qur’an; this is generally explained by the concept of bi-la kaifa, the claim that the literal meanings should be accepted without asking how or why. The Qur'an has sparked a huge body of commentary and explication, known as tafsir. This commentary is aimed at explaining the "meanings of the Qur’anic verses, clarifying their import and finding out their significance." and best tafseer is done by Allah himself. Because the Qur’an is spoken in classical Arabic, many of the later converts to Islam (mostly non-Arabs) did not always understand the Qur’anic Arabic, they did not catch allusions that were clear to early Muslims fluent in Arabic and they were concerned with reconciling apparent conflict of themes in the Qur’an. Commentators erudite in Arabic explained the allusions, and perhaps most importantly, explained which Qur’anic verses had been revealed early in Muhammad's prophetic career, as being appropriate to the very earliest Muslim community, and which had been revealed later, canceling out or "abrogating" (nāsikh) the earlier text (mansukh). Memories of the occasions of revelation (asbāb al-nuzūl), the circumstances under which Muhammad had spoken as he did, were also collected, as they were believed to explain some apparent obscurities. Ja'far Kashfi defines ta'wil as 'to lead back or to bring something back to its origin or archetype'. It is a science whose pivot is a spiritual direction and a divine inspiration, while the tafsir is the literal exegesis of the letter; its pivot is the canonical Islamic sciences. Allameh Tabataba'I says that according to the popular explanation among the later exegetes, ta'wil indicates the particular meaning towards which a verse is directed. The meaning of revelation (tanzil), as opposed to ta'wil, is clear in its accordance to the obvious meaning of the words as they were revealed. But this explanation has become so widespread that, at present, it has become the primary meaning of ta'wil, which originally meant "to return" or "the returning place". In Tabataba'I's view, what has been rightly called ta'wil, or hermeneutic interpretation of the Qur’an, is not concerned simply with the denotation of words. Rather, it is concerned with certain truths and realities that transcend the comprehension of the common run of men; yet it is from these truths and realities that the principles of doctrine and the practical injunctions of the Qur’an issue forth. Interpretation is not the meaning of the verse; rather it transpires through that meaning - a special sort of transpiration. There is a spiritual reality which is the main objective of ordaining a law, or the basic aim of describing a divine attribute; there is an actual significance to which a Qur’anic story refers. According to Allameh Tabataba'I, there are acceptable and unacceptable esoteric interpretations. Acceptable ta'wil refers to the meaning of a verse beyond its literal meaning; rather the implicit meaning, which ultimately is known only to God and can't be comprehended directly through human thought alone. The verses in question here are those which refer to the human qualities of coming, going, sitting, satisfaction, anger, and sorrow, which are apparently attributed to God. Unacceptable ta'wil is where one "transfers" the apparent meaning of a verse to a different meaning by means of a proof; this method is not without obvious inconsistencies. Although this unacceptable ta'wil has gained considerable acceptance, it is incorrect and cannot be applied to the Qur’anic verses. The correct interpretation is that reality to which a verse refers. It is found in all verses, the decisive and the ambiguous alike; it is not a sort of a meaning of the word; it is a real fact that is too sublime for words. Allah has dressed them with words so as to bring them a bit nearer to our minds; in this respect they are like proverbs that are used to create a picture in the mind, and thus help the hearer to clearly grasp the intended idea. Therefore Sufi spiritual interpretations are usually accepted by Islamic scholars as authentic interpretations, as long as certain conditions are met. In Sufi history, these interpretations were sometimes considered religious innovations (bid'ah), as Salafis believe today. However, ta'wil is extremely controversial even amongst Shia. For example, when Ayatollah Ruhallah Khomeini, the leader of Islamic revolution, gave some lectures about Surat al-Fatiha in December 1979 and January 1980, protests forced him to suspend them before he could proceed beyond the first two verses of the surah. The Qur'an retells stories of many of the people and events recounted in Jewish and Christian sacred books (Tanakh, Bible) and devotional literature (Apocrypha, Midrash), although it differs in many details. Adam, Enoch, Noah, Heber, Shelah, Abraham, Lot, Ishmael, Isaac, Jacob, Joseph, Job, Jethro, David, Solomon, Elijah, Elisha, Jonah, Aaron, Moses, Zechariah, John the Baptist, and Jesus are mentioned in the Qur’an as prophets of God (see Prophets of Islam). Muslims believe the common elements or resemblances between the Bible and other Jewish and Christian writings and Islamic dispensations is due to their common divine source, and that the original Christian or Jewish texts were authentic divine revelations given to prophets. The Diatessaron, Protoevangelium of James, Infancy Gospel of Thomas, Gospel of Pseudo-Matthew and the Arabic Infancy Gospel are all alleged to have been sources that the author/authors drew on when creating the Qur'an. The Diatessaron especially may have led to the misconception in the Qur'an that the Christian Gospel is one text. However this is strongly rejected by Muslim scholars, who maintain that the Qur’an is the divine word of God without any interpolation, and the similarities exist only due to the one source. After the Qur’an, and the general rise of Islam, the Arabic alphabet developed rapidly into a beautiful and complex form of art. An Arabic Quran with Persian translation. Most Muslims treat paper copies of the Qur’an with veneration, ritually washing before reading the Qur’an. Worn out, torn, or errant (for example, pages out of order) Qur’ans are not discarded as wastepaper, but rather are left free to flow in a river, kept somewhere safe, burnt, or buried in a remote location. Many Muslims memorize at least some portion of the Qur’an in the original Arabic, usually at least the verses needed to perform the prayers. Those who have memorized the entire Qur’an earn the right to the title of Hafiz. Based on tradition and a literal interpretation of sura 56:77-79: "That this is indeed a Qur’an Most Honourable, In a Book well-guarded, Which none shall touch but those who are clean. ", many scholars opine that a Muslim perform wudu (ablution or a ritual cleansing with water) before touching a copy of the Qur’an, or mus'haf. This view has been contended by other scholars on the fact that, according to Arabic linguistic rules, this verse alludes to a fact and does not comprise an order. The literal translation thus reads as "That (this) is indeed a noble Qur'ān, In a Book kept hidden, Which none toucheth save the purified," (translated by Mohamed Marmaduke Pickthall). It is suggested based on this translation that performing ablution is not required.